AAGSAR GENEALOGY BLOGGERS: Tooting Their ANCESTOR Horns! :) | You Got Roots?! AAGSAR Tumblr: You Got Roots? Don’t EVER allow anyone to tell you African American researchers aren’t taking their Ancestor challenges seriously, digging deep and bringing their family histories online [in mass] for community sharing and preservation! Our African American Genealogy and Slave Ancestry Research (AAGSAR) group hosted via Facebook has supported nearly 200 BRICK SLAYERS and 90 genealogy blog contributors since kicking-off last August! Our Ancestors have entrusted us to tell their stories. We’re committed to preserving our individual family legacies and moving our collective community research forward. 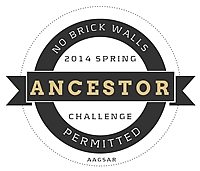 If you have ANY DOUBT, spend time visiting the AAGSAR Genealogy Blogs below! Yes indeed, I’m tooting our ANCESTOR horns!